Workers enquiry needed to identify and eliminate all exposures to carcinogens. 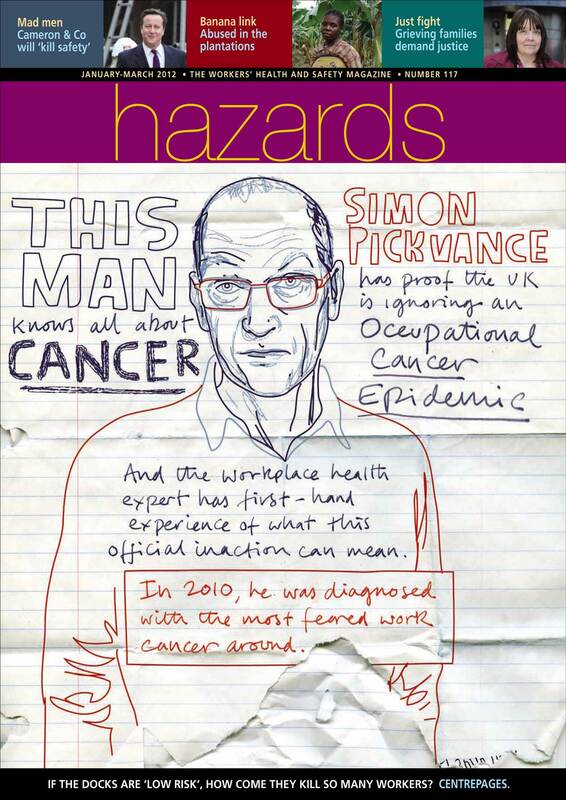 The Hazards Campaign says the HSE intervention paper on occupational cancer to be presented to the HSE Board meeting on 22nd August in Bootle, while more detailed than the original rejected paper, “fails to acknowledge the actual scale of cancer caused by work(1). The paper is based on a fairy tale unrealistic view of the world of work today, ignores many known carcinogens, shows little interest in finding unknown exposures, underestimates the numbers of workers exposed and shows no sense of urgency to tackle this massive but preventable workplace epidemic. Because of the lack of action now, more people will develop occupational cancers and die from them in the future. “Rushton estimates that work cancer kills 8,000 (5% of all cancers) or at least seven times as many workers as are killed by work injuries every year, and affects a further 14,000. Hazards estimates, based on work by international cancer specialists, place the toil even higher at 12% of all cancers. That is 18,000 deaths and over 30,000 cases of cancers related to work each year in GB (2). Occupational cancer researcher Simon Pickvance warns: “The HSE has been in denial about work cancer for over three decades, depending far too heavily on epidemiology which is only capable of seeing widespread, long-established problems amongst large numbers of workers, employed for long periods of time, in large workplaces such as mines, mills and manufacturing. This is totally unsuitable for today’s, smaller and fast evolving workplaces with more complex, and diverse exposures. It is incapable of picking up high risk exposures affecting smaller groups of workers. We welcome HSE’s response to the detection of hazardous exposure to azo dyes in the engineering industry by members of Hazards Campaign, but this is just one of many such high risk groups that can be identified using mass participatory methods of relating workers’ exposures to case reports. A fully participatory approach towards identifying exposure scenarios and methods for toxic use reduction must be the way forward. The Rushton estimates for the HSE continue to under count the number of workers exposed. On diesel fumes exposure alone, it is simply incomprehensible that the well over a million workers who have a raised risk of a cancer because they work in diesel-exposed jobs become ‘over 10,000’ in HSE’s estimation – and a million is just a fraction of the total diesel-exposed workforce”. The Hazards Campaign joins occupational cancer campaigners in demanding a workers inquiry to identify all workplace exposure to carcinogens and urgent action to enforce their elimination; a spokesperson said: “We need proactive enforcement of existing legislation (4), and in the absence of reliable figures on numbers of people exposed (the underestimation of diesel-exposed workers is only the latest in a series of HSE blunders in calculating exposed populations) the over-dependence on the Rushton burden calculation (how much cancer is work-related ? ),in setting priorities for action must stop. Campaigners argue that the response outlined in the HSE paper is based on a combination of dithering, denial, and delay. Their ‘wait and see’ approach and leaving the job up to other agencies, while they continue to do a little bit more of what is currently ineffective, is completely inadequate to the task of preventing work related cancers. 1. HSE supplementary paper on occupation cancer: ‘Occupational cancer, priorities for future intervention – supplementary paper’ The initial paper was rejected by the HSE board in May 2012. 4.COSHH- Control of Substances Hazardous to Health Regulations. ← Is The HSE Keeping Women In The Dark On Shift Work Breast Cancer Link?